This Simple Classic Marinara Sauce is the perfect starting point for so many recipes. It can be used in soups, as a pizza sauce, as a dipping sauce, and it can transform a quick week-night pasta supper into a gourmet meal in less than 25 minutes. September is often associated with a flurry of activities. Summer cottages are getting ready to be shut down, summer vacations have come to an end, the kids are back in school, and mother nature has completed yet another cycle and is getting ready to go dormant. I also associate September with tomatoes. Canning Whole Tomatoes is one of the best ways to preserve this Italian staple, which is used in so many classic Italian dishes. A quick internet search will provide you with infinite variations of another Italian staple, “marinara sauce from scratch”. I prefer this simple marinara sauce best, because it relies on so few ingredients. Like all Italian cooking, the strength of the dish is in the quality of the ingredients! What do I need to make Classic Marinara Sauce? Olive oil. Invest in a good quality olive oil, you will taste the difference it makes. Garlic. Provides loads of flavor. Tomatoes. Canned tomatoes are best for this San Marzano sauce. Red Pepper Flakes. Just a little to provide a touch of heat. Feel free to add more or less, it is your choice! Basil. This regular Italian culprit makes an important contribution to the overall flavor. As far as accessories are concerned, you need a cutting board, a sharp knife, a wide skillet and a wooden spoon. Wait until you see how easily this Italian marinara sauce recipe comes together! Prep the garlic: I will usually use about 3 cloves of garlic that I have crushed with the side of my knife. Feel free to use more (or less) according to your personal preference. Get the tomatoes ready: I will usually use canned tomatoes as part of my marinara sauce ingredients. This makes the whole process quick and simple. And there is no shortage on taste because of the type of canned tomatoes I purchase. If possible, purchase San Marzano whole canned tomatoes packed in their own juices and not tomato sauce (as these will be a little sweeter). Look for tomatoes packed in Italy as they will be of a superior quality. If available in your region, make sure to purchase tomatoes which have been certified DOP. If you are interested, Serious Eats has a great article on the DOP tomato. Time to turn on the heat and make this classic marinara sauce recipe: Use a large wide skillet to heat a few tablespoons of olive oil over medium heat. Lower the heat to medium-low and add the crushed garlic. Sauté for about one minute. Make sure not to burn your garlic. What we are looking for is a light toasting. You know it’s time to add the tomatoes when the aroma of the garlic hits the air. Simmer the tomatoes: Once the tomatoes and the red pepper flakes have been added to the sautéed garlic, turn the heat back up to a medium-high. We are looking for a vigorous simmer. Stir occasionally for the next 10-15 minutes. I use the back of a wooden spoon to break up the tomatoes while they are simmering in the saucepan. You can also use a potato masher. During this time the tomatoes will thicken as the liquid evaporates. (This 15 minute window will allow you with more than enough time to get your pasta cooked (just in case you were planning on having pasta)). Add the basil: When you are just about ready to pull the sauce from your stove top, add the fresh basil and adjust the seasonings. I always add basil at the end of the simmering time because basil is extremely heat sensitive. (If you were making a pasta dish, you would throw in the al dente pasta in this pan along with 1/4 – 1/2 cup of the starchy pasta cooking water. A couple of shakes and swirls and voila… gourmet pasta dish). See, what I mean? Effortless and uncomplicated. And there you have it, an easy pasta sauce recipe broken down in just 5 simple steps. (For those of you that have asked me, I like to serve this marinara sauce with my Baked Parmesan Encrusted Zucchini Sticks. There are only four basic ingredients for this authentic marinara sauce -canned tomatoes, garlic, olive oil and fresh basil. 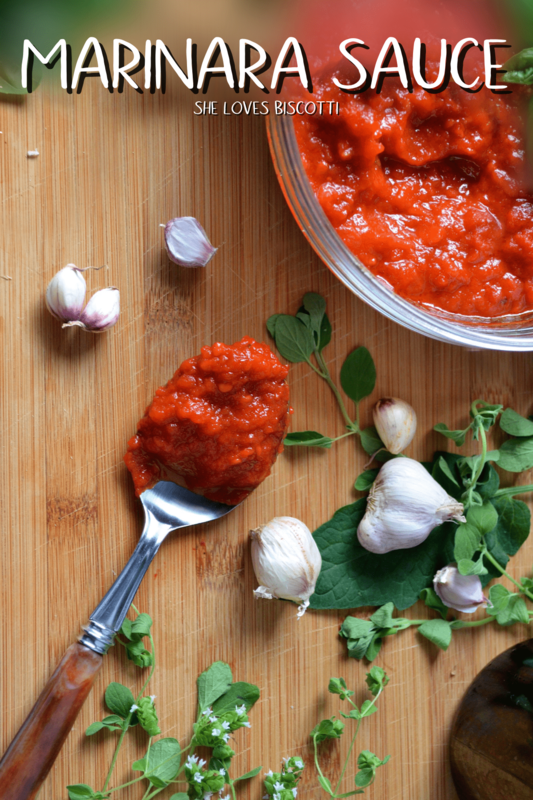 Make sure to use the freshest ingredients in order to make the best homemade marinara sauce. If you find this quick pasta sauce tastes acidic, try adding a few pinches of sugar to balance out the taste. The addition of a whole carrot, while this simple pasta sauce is simmering, helps reduce the acidity. Pizza sauce vs marinara, what’s the difference? The first difference is that an authentic Pizza Sauce is uncooked; the second difference is that there is (usually) no oregano in a simple marinara sauce. Regional variations and family recipes will definitely play an important factor in determining everyone’s favorite marinara sauce. Chunky or pureed? With or without onions? Addition of carrots or other vegetables? Sugar, honey, wine? I could go on but I think you get the point. There is no right way to make this sauce. Let your taste buds be your guide. I have just shared with you my Mom’s marinara sauce from scratch. You can never go wrong with simple, wholesome and good quality ingredients. ★★★★★ If you have made this Marinara Sauce recipe, I would love to hear about it in the comments below and be sure to rate the recipe! 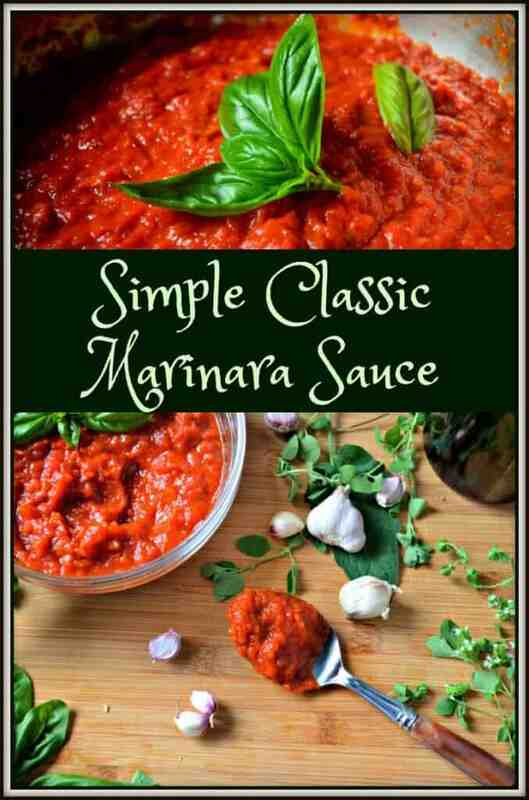 This Simple Classic Marinara Sauce Recipe is the perfect starting point for so many recipes. Just a few simple ingredients and 25 minutes is all you need. Add the lightly crushed garlic cloves and continue to cook for another minute or so. At this point the garlic should be fragrant. (Make sure not to overcook the garlic as this will produce a bitter sauce). Add the tomatoes. You can use a potato masher or the back of a wooden spoon to break them up as they are simmering. Bring to a boil and then reduce heat to obtain a vigorous simmer. Simmer for about 10-15 minutes or until the sauce is thickened. Add the basil and remove from heat. Note: Can be made ahead and refrigerated in an airtight container for 5 days. If you prefer a sauce with a smooth consistency, this can easily be achieved in a food processor. The sauce can easily be frozen. Total yield is 2 cups of marinara sauce. 1 serving = 1 cup of sauce. IF YOU ENJOYED THIS Classic Marinara Sauce POST, SAVE IT FOR LATER. PIN IT TO YOUR SAUCE BOARD! Hi, does the tomatoes have seeds on it? It never occurred to me to check where my tinned tomatoes had been canned before. I’ll be checking next time I’m in the supermarket now! I learned something today. Thanks for the link to the explanation of DOP. I love the simplicity of marinara and I agree that there are so many versions – as many as there are people. Everyone has their own way to make it. Thanks. Hi Maria! What a great post!! I pinned it to try for later. BTW, I’m drooling over your photos….YUM!